Our dedicated sales offices are located in the UK, Europe, North America, Latin America and southern Africa. Avocado and other fruit estates are operated in major origins including southern Africa, Mexico, Chile, Colombia, Peru, and California in the USA. Greencell, an established fresh fruit and vegetable company in England, became part of the Westfalia Group in September 2008. The company manages over 100 000 tons of fruit per year. To read more about Greencell, click here. Access to pre-pack facilities and marketing channels in France provides Westfalia Fruit with a footprint in the largest avocado-consuming country in continental E​urope. French partner Comexa ensures the Westfalia Fruit Group maintains a direct link to market requirements in the EU, establishing partnerships that enable the business to address new market developments. To read more about Comexa, click here. Westfalia Fruit’s Netherlands operation – Westfalia Marketing BV – is located in the Maasdijk area of Rotterdam in the Netherlands. In addition to being an expert in avocados, the operation has developed key accounts in Europe for mangoes and other exotics. Packaging formats range from bags and nets to flow-wraps and cartons. The marketing office of Westfalia Fruit in Austria was established in November 2016, confirming a further step in Westfalia’s strategy to create a closer link for customers to their international production base. The operation services the needs of selected customers in Austria and Eastern Europe. Westfalia Fruit concluded a transaction with Chile-based fruit-supply group Agricom in January 2018 that secures the resulting partnership a leading position in global avocado supply. The transaction aligns the two organisations’ interests in the Americas in order to maximise synergies, building on their common legacies of innovation and sustainability, while delivering a reliable supply of quality avocados and other produce to better serve their customers in global markets. The Westfalia Fruit Group has established two avocado packhouses in Colombia, South America – one in Rionegro and the other in Sonson. This has built up credibility of the origin in the European marketplace and now fulfils the requirements of North American customers. Camet Trading is a modern and dynamic business that joined the Westfalia Fruit Group in January 2017. The company provides technical support to more than more than 100 growers from 1,800 hectares throughout the country’s coast and highlands. The operation based in California supplies mainly Hass avocados to the Americas. Through its stakeholding in a local farm management company, Westfalia Fruit Americas has access to shareholder-owned ranches. At present, 931 hectares (2 300 planted acres) consisting of 59% avocado (primarily Hass) and 41% lemons are managed. Aztecavo is a prominent Mexican-owned exporter of avocados. Westfalia acquired 398 hectares of land in Mozambique to establish Westfalia Fruto Moçambique, which has begun development of Hass and Carmen®-Hass avocado orchards. In 2016, Westfalia Fruit acquired a share in Timini, a local operation that sources mangoes from smallholder farmers and dries the product for export to Europe and the USA. Burkina Faso has a surplus of mangoes with cultivars that are suitable for drying. Westfalia’s investment in Timini resulted in the company building a new state-of-the-art drying facility in Burkina Faso. To learn more about Timini, click here. Based in Tzaneen in the Limpopo province, Westfalia Marketing Africa is ideally situated to supply southern Africa-grown avocados directly to retailers and other customers. The product range also includes mangoes, litchis and citrus fruit. WMA is also the largest exporter of South African avocados, mainly to European markets. With three plants in South Africa, based near Tzaneen, Johannesburg and Howick respectively, Westfalia Fruit Products processes avocado oil, guacamole and puree, IQF pieces and slices and HPP products. The company also produces dried fruit including mango. Westfalia Technological Services (WTS) is the research division of Westfalia Fruit and the largest privately-funded subtropical fruit research organisation in the world. The in-house dedicated team of scientists and technicians at WTS focusses on varietal development, innovation and environmental matters​. 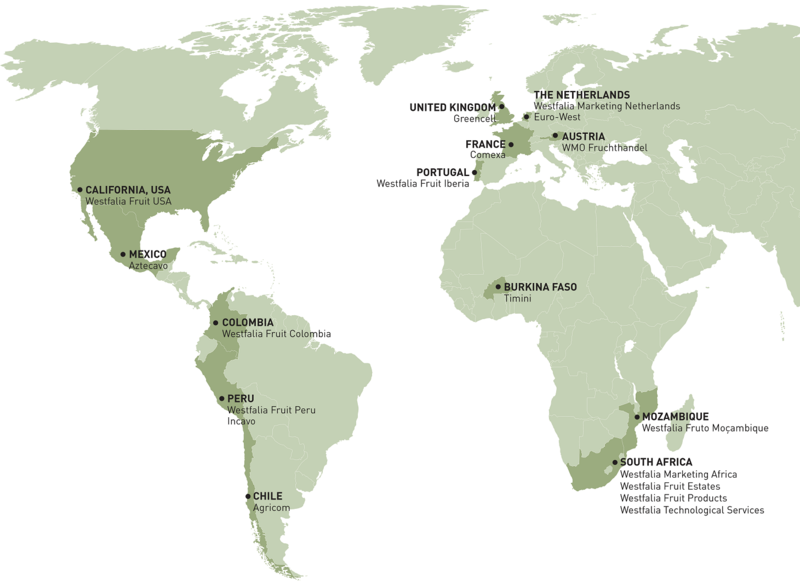 The Westfalia Fruit Group operates or is affiliated with many nurseries around the world. These nurseries are fully accredited and recognised for the provision of good-quality avocado and other trees. In South Africa, Westfalia’s two nurseries are situated in Modjadjiskloof near Tzaneen in the Limpopo Province of South Africa, 400km north-east of Johannesburg. They supply top-quality clonal ​rootstock avocado trees for use in the Group’s own orchards as well as for sale to customers in the agricultural sector, both nationally and internationally. Westfalia’s nurseries have the unique advantage of utilising the cutting-edge scion and rootstock development programme of Westfalia Technological Services.